Refacing the existing permanent sign for GAEDEKE GROUP lcoated at 17 Mckinney Avenue. HELLO DAFFODIL, featuring a satin gold aluminum return, this flush mounted individual channel letter sign was fabricated & installed by Giant Sign a few months ago. Please enjoy Giant Sign’s additional photographs capturing the unique window graphics, designed and completed by us. Giant Sign fabricated & installed the wall sign as well as painted the wall to pink color. 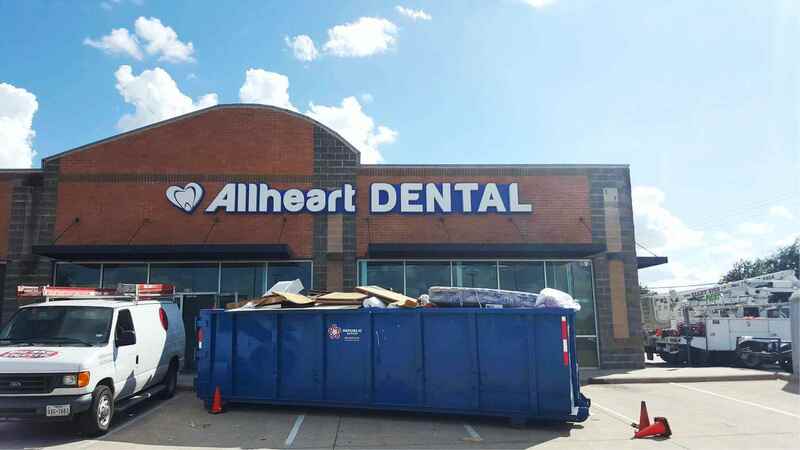 The non-lit double sided blade sign was provided by the customer to Giant Sign for installation. Smokers Dream in the city of Keller has moved to the new location, to the city of Southlake. Smokers Dream treats cigarettes, pipes, hookahs and tobacco along with numerous flavors. They serve pizza, pasta, salad, and wings (wings are the bomb!). Giant Sign took charge of their signs for their first location in the city of Plano only few months back, and now the grand opening for their second location is just around the corner. Huge congrats from Giant Sign to In-Fretta on their next big step! Giant Sign fabricated & installed one set of individual dual-lit channel letters. Sol Sunless Tan in Mockingbird Lane, Dallas. They use naturally derived ingredients and organic dihydroxyacetone, if you are interested in getting gorgeous bronze skin color, you should give it a shot. HOT TUBS & BBQ GRILLS in Flower Mound. Giant Sign fabricated & installed Hot Tubs & BBQ Grills signs for Southern Leisure for both of their locations. Giant Sign installed total three sets of wall signs for Metro City Bank in the city of Dallas. We were requested to take charge of the installation of the project. We are a fully equipped company providing top-notch installation service as well as de-installation. Giant Sign has been in business over 30 years and it is still going strong! Already have a national sign company to make your sign, but need a dependable sign company to handle the logistics locally, then give us a call. We have and continue to work closely with the sign companies that national and international companies trust with their branding guidelines. In most of our installation only programs, we coordinate confidentially on behalf of the other sign company the following tasks: read proposed plans, provide thorough surveys/photos, handle permitting, receive shipments, install and perform final inspections.